Although smartphone growth is slowing down globally, users in 2018 spent on average three hours a day on their mobile phones, which translates into one a half months a year (! ), found the latest study by App Annie. , says the annual State of Mobile 2019 market report in which App Annie explores how mobile has transformed every industry across the globe and become a mainstay of consumers' daily routines. 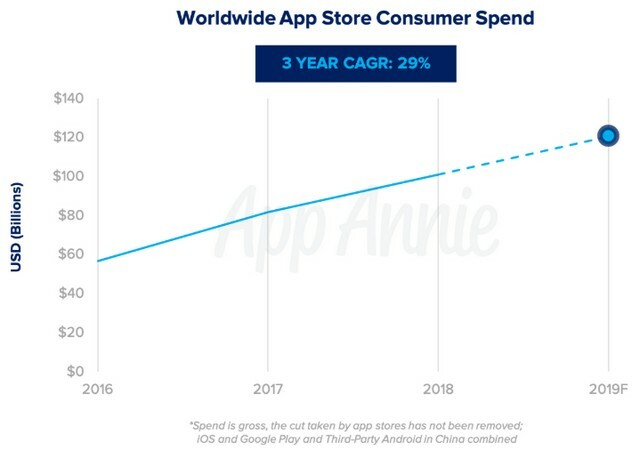 For its part, China accounted for nearly half of total apps downloaded in 2018, mobile data and analytics provider App Annie said. Consumers spent 101 billion US dollars on apps worldwide through paid downloads, in-app purchases and in-app subscriptions last year, according to the report. China accounted for almost 40% of this spending. Most of those purchases were made in mobile gaming. , said Lexi Sydow in an App Annie blog post. Among the top 300 tech companies worldwide, Chinese firms won 32% of consumer spending, bringing in about USD 19.6 billion in revenues. For comparison, top American firms generated about 22% of that pool, CNBC reported. Many people in countries such as India and Indonesia are just getting connected to the internet for the first time — mostly through smartphones — but they are not yet spending on app stores in the same way Chinese users are, Jaede Tan, a regional director at App Annie, told CNBC. Consumers are also engaging with their phones more than ever before: in Indonesia, an emerging market, smartphone users spent 17% of their time in apps, or roughly 4 hours per day. In mature markets like the U.S. and Canada, the average was 3 hours per day. The trend toward mobile will have massive ramifications for every industry, said Sydow. The banking industry, for example, should know that consumers downloaded 3.4 billion finance and banking apps in 2018, up 75% since 2016, and that this could open up massive markets in emerging countries, as those who don’t have a bank now do likely have a smartphone. "Restaurant chains and privately-owned shops alike should understand how the rise of loyalty programs, text promotions and international expansion of food delivery can impact their business. Travel businesses should realize that while the top 5 car sharing apps in the United States grew a steady 25% year over year in 2018, bike and scooter sharing apps saw a remarkable 530% growth, albeit from a smaller user base," she added.